For my long trip this past week, I knew I would need something to keep me entertained in the car. I love to read, but doing it in a vehicle usually ends in tears (or at least nausea) for me. 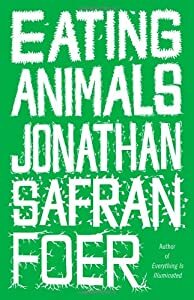 I decided to give audio books a try, and so I downloaded “Eating Animals” by Jonathan Safran Foer (of “Everything Is Illuminated” fame) to my iPod. “Eating Animals” is the story of Foer’s decision to delve into what exactly is it we’re eating when we pick up a pork chop or chicken nugget and pop it into our mouths, something that became important to him with the birth of his son. Though Foer is vegetarian, it’s not a book that tries to convince you that’s the only way to eat; instead, Foer discusses the horrors (and really, it’s awfully horrific) of factory farmed animals’ lives and deaths. Before reading (or rather, listening to) this book, I was already a vegetarian. My reasons were mainly those of health: having psoriasis puts me at a higher risk of metabolic syndrome and, quite frankly, eating meat just made me feel bad and often triggered flares or mini-flares. It just wasn’t worth it to eat animals anymore. After listening to this book, my decision to go veg is now also influenced for reasons of animal welfare, if not necessarily animal rights. The atrocities Foer mentions are unnecessary but an unsurprising by-product of a system (factory farming) that sees animals as dollar signs and workers as expendable. I just don’t see the need to pay into that system, to give my farming proxy, as Foer put it, to some big corporation shoving antibiotics and God knows what else into these animals, keeping them as sick as possible because that maximizes profits. Now, I’ve just got to convince the Professor to stop eating factory farmed meat and go with locally raised animals, and we’ll be all set. And if I could get people to stop accidentally feeding me animal products (I’m looking at you, quinoa cooked in beef bouillon) or telling me lobster/fish/poultry isn’t meat (duh, of course it is; those are all animals), then I’ll really be good to go. So, if you’re interested in food, animal welfare or rights, public health, increases in autoimmune disorders, vegetarianism or you just eat meat, this is a must-read.